Business Property Relief (BPR) is a well-established initiative introduced in 1976 and managed by the UK Government. Offering an effective means of protecting your estate from a potential Inheritance Tax (IHT) liability, it is one of several tax efficient investment options, providing business owners with a means of transferring their business interest(s) to the beneficiaries of their will without incurring IHT upon their death. If you have owned a business for two or more years (depending on the nature of the business), you should qualify for BPR. If achieving IHT protection for your estate is something you would like to secure in a short timescale, BPR offers an appealing option - an in our guide we provide an insight into how equity investments in UK businesses eligible for BPR can shelter your estate from Inheritance Tax. A background to Business Property Relief (BPR). Who Business Property Relief (BPR) is available to. 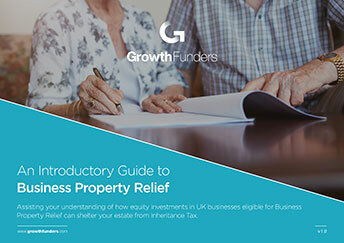 To receive the guide, simply fill out the form and get instant access to all our information and insights on Business Property Relief (BPR).